SQLBase v12 – The clue is in the name. - Bankside Systems Ltd.
SQLBase is known for its DBA-less, ‘set and forget’ like operations that reduce database administration almost to zero. This is an important feature for vertical solutions, as it decreases the cost associated with end-user support as well as making it more cost-effective for large end-user deployments. Of course DBA free does not imply anything less than 24 x 7 reliability. SQLBase v12 promises to be a whole new box of magic. The clue is in the name. v12 power , v12 performance with the 2stroke cost of ownership we now take for granted. So the word is, that an already perfect small footprint – big access reputation is set to provide even better…. The SQLBase DDEX driver for Visual Studio allows Visual Studio’s Server Explorer to manipulate and view SQLBase database objects and data. And you get tight integration of SQLBase data sources with Visual Studio GUI objects like the data grid view. 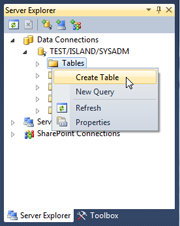 Use Visual Studio’s Server Explorer to create, modify and drop SQLBase tables. You can also write, modify and drop SQLBase Stored Procedures, examine SQLBase table data and to create database queries and use Visual Studio’s GUI objects like the data grid view and link them to SQLBase data sources without coding using data sets. Anyway – we will see. In the meantime I have a 100Gb SQLBase dB to err….umm… well… just do nothing much with really, other than a standard annual unload/reload. After a suitable backup of course .